Every ecommerce entrepreneur’s secret ambition is to design their online stores like the mighty Amazon or Alibaba. This ecommerce website design checklist is prepared based on ecommerce design principles to help business owners build a potential ecommerce website and also to improve their conversion rate. Even though it is quite hard to replicate the exact design characteristics of Amazon or Alibaba, you can take suggestions about website design and functionality, and implement it on your website to boost sales and customer experience. This blog post covers almost all the essential website design elements that your ecommerce site should follow to leave an impression on your customers' minds. 01. Compatibility of the ecommerce website design. 02. Display the cart icon on every page. 03. Place the brand logo at a prominent position. 04. Provide search bar on all possible pages. 05. Use well-defined navigation menus. 06. Provide a way to contact on every page. 08. The website should load real quick. 09. Use only high-quality images. 10. Utilize a call-to-action to the fullest. 11. Provide filtering and sorting options. 12. Always include customer reviews and scores. 13. Provide an option to buy later. 15. Show stock availability on the product page. 17. Top selling and recommended products. 19. Provide different payment methods. The ecommerce website should be able to run flawlessly on desktops, tablet devices, and smartphones. 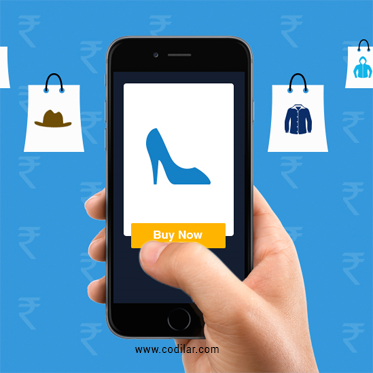 Almost 63.5% of ecommerce sales are made from mobile phones, and it is expected to grow to 70.4% in the next two years. You can use this tool from Google to check the mobile compatibility of your website. The general ecommerce website design practice is to place the cart icon on the top right corner of the page. This is done to help the customers to access the cart with just a click. Hence, the icon should be in the right size and different color to stand out from the rest of the website. Also, displaying the number of items present in the cart will help the customer know how many items they have added, without going into the cart. The above image shows that Walmart has the cart icon on the top right part of the website. Now, let’s check the product page. 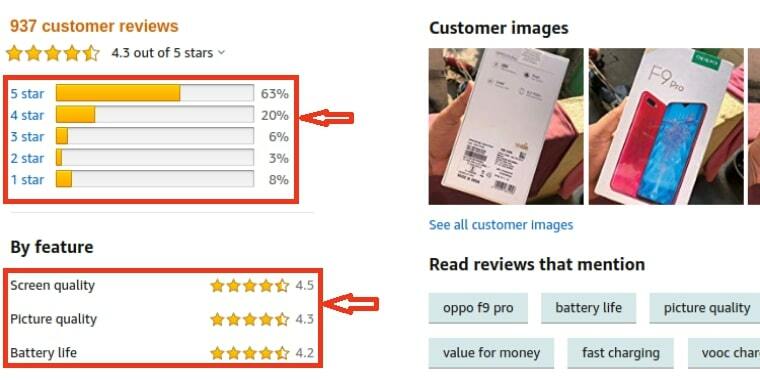 The above image is from Amazon and you can clearly see the position of the brand logo. It does not matter if your online store is well-established or not, but the logo of the brand should be put in a place where customers would immediately notice it. 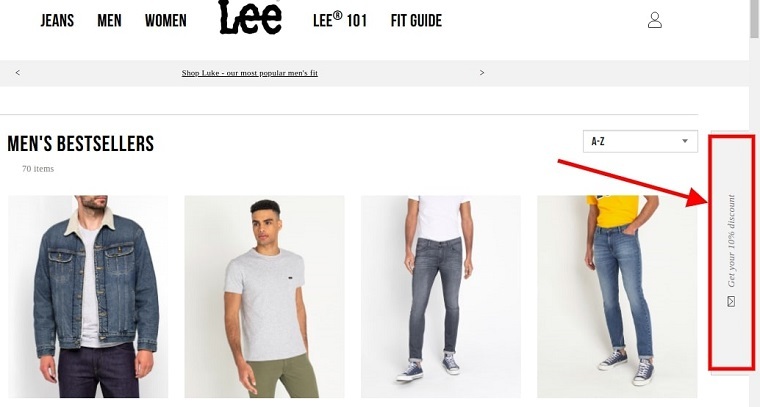 The common ecommerce site design practice is placing the brand logo at the top left of the page. 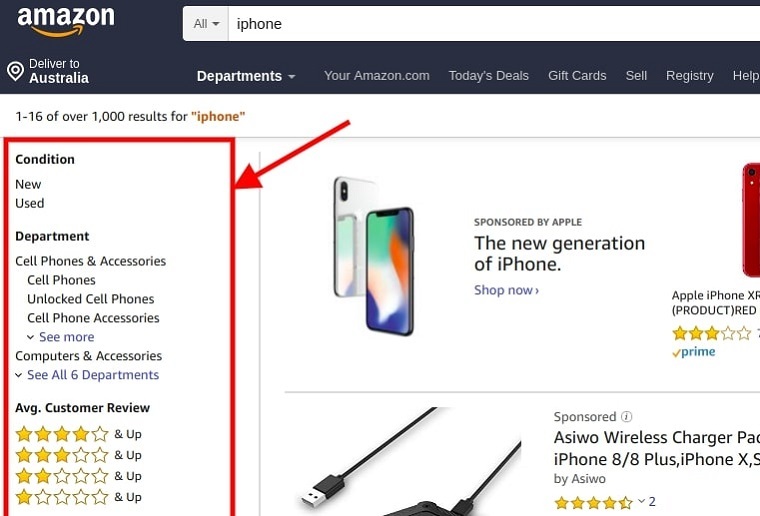 The above image is from Amazon and it provides a search bar even on a product page. Not all customers have time to go back to the homepage to search for a product. Hence, it is necessary to provide a search bar on all possible pages; checkout page can be an exception. This will help the customers to easily find products even when they are on other pages. Providing search suggestions is an added advantage, and it will save effort and time of customers. Make sure that the suggestive search terms are relevant to what the customer is actually searching for. Navigation menus help customers quickly reach the section that they want to. Hence, the menus should be based on the product you are selling. Place only the main categories and important sections on the navigation menu bar. Also, create a drop-down list of sub-categories to help users directly jump to a particular section. 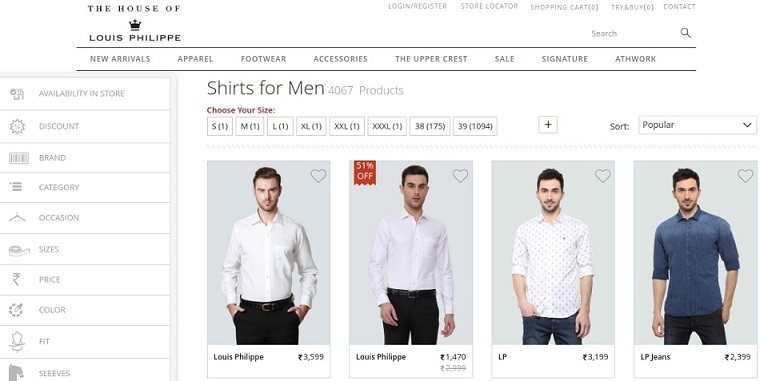 Since Allen Solly is an apparel brand, it has listed the important sections such as women, men, junior, footwear and so on. The drop-down menu is also neatly organized to show important categories. Adding contact details allows users to contact the customer care service at every phase of their shopping. It gives assurance to customers. Most ecommerce store designs follow the trend of adding customer support details at the bottom of the page. Puma provides a link for customers to contact them even on the checkout page. The customer care contact is also provided at the top, to help their customers reach the customer support team without the need to scroll the page. E-commerce businesses are focusing more on social media as they provide options to directly advertise and sell products. The links to social media accounts are provided at the bottom of the homepage, not only for ecommerce sites but for general sites too. So that customers can easily follow them and get updates via social media. If you are following omnichannel or multichannel retail then social media accounts are crucial for sales. Hence, placing them in the right place plays an important part. Here’s a video from Moz discussing ecommerce site structure and placement of site elements. It doesn't matter if you have incredible products, awesome discounts, and low shipping charges - if the customer leaves the website before visiting it! Reports say that almost 40% of online shoppers leave the site if it takes more than three seconds to load. You don't have to necessarily compromise your ecommerce site design aspects to make the site faster. Follow the below three points to make your website faster. Images are very important for online sales and always add high-quality images of your products. Also, using photos of where the product is being used can create more impact. For example, if you are selling shirts, add photos of models wearing your shirts. All the above products have a picture of how they would look on people in real life. Customers would also like to see the products from different angles, especially if they are shopping for apparel products. Adding zoom options will enable customers to see products closely. Call to action should make the customer take the corresponding action. Use different colors for CTA buttons and place them appropriately to make them visible to customers at their first glance. Lee has utilized a call to action phrase even for its newsletter subscribers. Similar to navigation menus, filtering and sorting options help users to find the list of products that fit their requirements, without the need of going through the multiple variants of the product. The above image is a result for iPhone search in Amazon. The left portion displays the required filtering options to help the customers shop according to their requirements. Filters and sorting should be set up based on the products you sell and the characteristics of the product. Before buying a product, customers would like to know how it is working out for people who have already bought it. Therefore it is obvious for them to expect reviews from other customers. Adding customer scores can help them in making a quick decision. 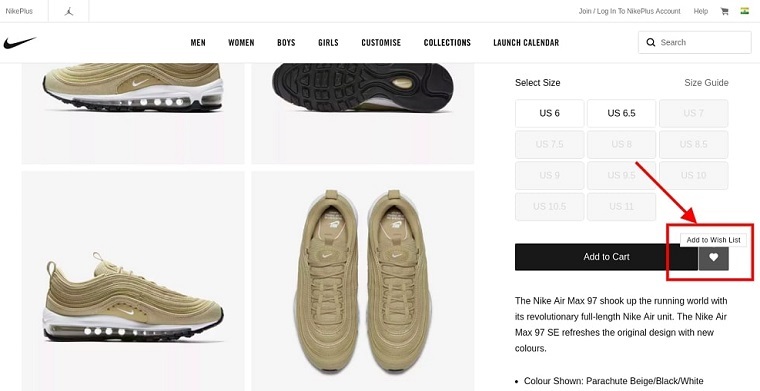 Online Nike store has a feature to let its users save items for later purchase. This feature is popularly called as “wishlist”. It should be noted that “buy now” or “add to cart” should be more appealing than “add to wish list” button so that users would buy products immediately instead of buying later. Nike has placed the “Add to Wish List” option next to the “Add to Cart” button to help customers quickly add products to their wish list. Videos are increasingly becoming the preferred format of consumption. Chinese ecommerce giant Alibaba has already started to incorporate product videos. These videos can be also be added to social media channels which could help in establishing the brand image. 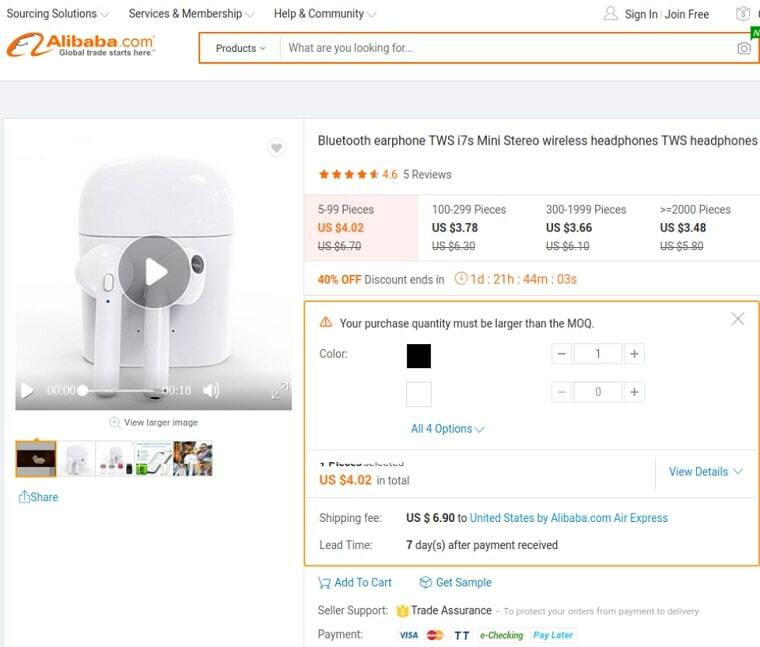 Alibaba has great product videos as shown in the below image. If a customer comes to know that the product is not available only at the final stage of the checkout process, then they would definitely be frustrated. 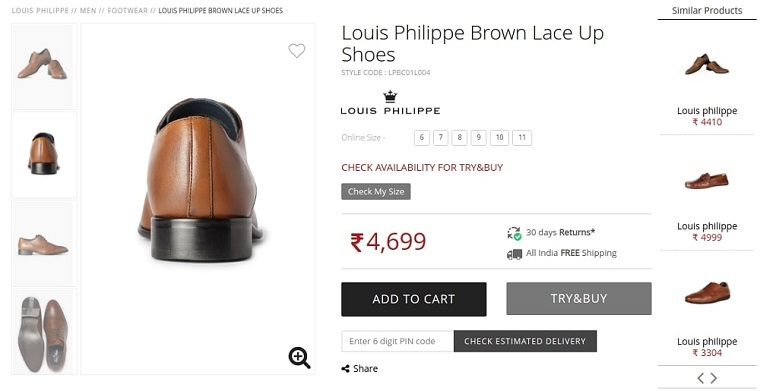 Instead, show the details of the stock availability directly on the product page. 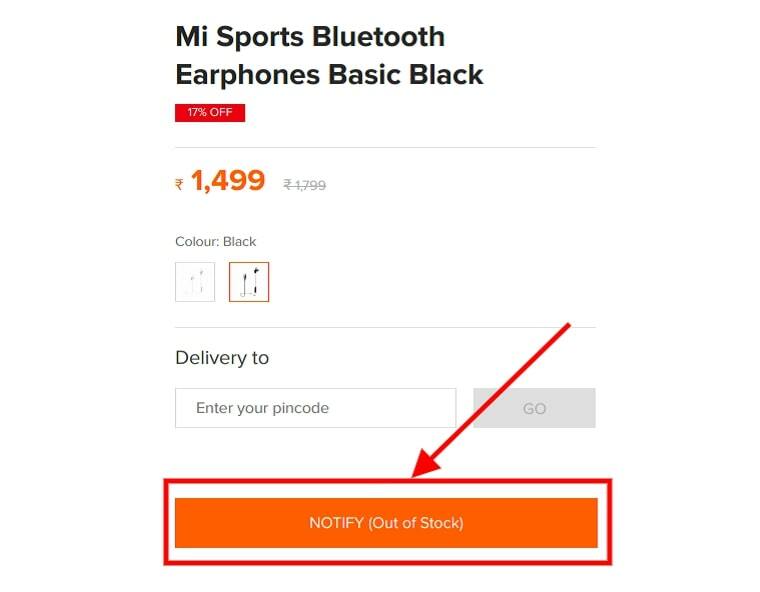 Xiaomi has the habit of showing out of stock of products when the inventory is zero and turning that into a lead generating tactic. Similar to availability show the details of additional charges such as shipping, packaging and so on. Additional charges were one of the top reasons for customers to abandon the cart. Therefore displaying additional fees is more important than it sounds. 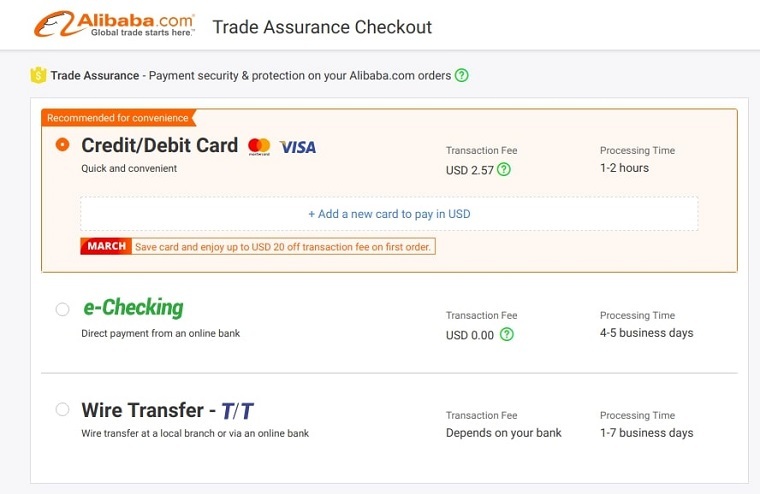 Alibaba displays the shipping charges along with the product cost. Having separate sections for top selling and recommended products can boost sales significantly. If a lot of customers have purchased a particular product, then chances are higher for a new customer to purchase that product. Furthermore, giving personalized recommendations can improve sales as it makes the whole shopping process easier. At Codilar, we recommend Tagalys to our customers for personalized recommendations, which has worked wonders for them. Alibaba shows many recommended products belonging to different categories based on the customer’s interest. Security badges give confidence to the customers that these products have high quality and they are trustworthy. Established businesses add security badges to products that are checked by them. Include the payment gateways that are most loved by your customers. Adding essential payment methods will also significantly reduce cart abandonment rate. Payment systems differ from one country to another and PayPal is a famous and widely used payment gateway. Trusted payment gateways like PayPal help customers who are facing difficulties in transactions. Authorize.net is also a popularly used payment system by ecommerce sites. If you are using a Magento ecommerce store then, you must see this new security update about Authorize.Net. Also, if your business is providing omnichannel retail service to customers then offering different types of payment methods is a must. Checkout process should not have many steps, and users should be asked to fill in only the required details. The process should be simple, and easy to understand for customers. All unnecessary information should be removed from the checkout pages. Amazon has a four-step checkout process where customers can complete the payment without any hassles. Also, various stages of the checkout process are precisely broken down and made into simple steps, instead of providing a single complex checkout page. Also, providing autofill feature during checkout process can improve customer convenience. This 20-point ecommerce website design checklist has the vital design factors that every ecommerce site should have to deliver impressive customer experience. There are plenty of online stores that offer better customer experience with swift loading, user-friendly interface, multiple payment options, and a seamless checkout process. Hence, a business failing to provide a better customer experience on its ecommerce site will lose customers to its competitors in a very short time.